Silvio De Sousa checking in for #KUbball next dead ball. Penn is 3-3 from deep. That's one way to fuel an upset bid. Under-16 timeout here in Wichita... Penn leads #KUbball 10-7, 14:49 1st half. KU 3-of-10 from the floor to start. Penn 3-of-6. "Trust the Process" chant breaks out in Wichita. To the fans' dismay, no sign of Joel Embiid here. Penn 3 of 3 on 3-pointers in the opening minutes. KU 1 of 4 but getting good looks. Garrett forgot to help out De Sousa on that drive. Easy layup by Brodeur. Graham tried a pick-and-roll lob for De Sousa but Brodeur read it and knocked the pass away for KU's 3rd turnover. BREAKING: Penn missed a 3. Illegal screen on De Sousa. Lightfoot back in. Second foul on Malik Newman. Awful start for KU. Not the best stint for Silvio out there... He checks out. Last time that happened, he did very well coming back in. Time will tell. #KUbball down 12-7 and Newman just picked up his 2nd foul. 11:58 to play 1st half. Moving pick called on De Sousa. KU has 4 turnovers on its first 13 possession. And shooting 3 of 11. Penn up 12-7. #KUbball 11:58 left in 1st. Jayhawks haven't scored in 4:41, Penn on an 8-0 run. Pro-KU crowd trying to urge the Jayhawks along. Graham answers with a layup to break the long scoring drought. Azubuike is up off the bench. To a ROAR from the #KUbball fans here..
Nice inside move by Lagerald Vick. KU will need all of that today. 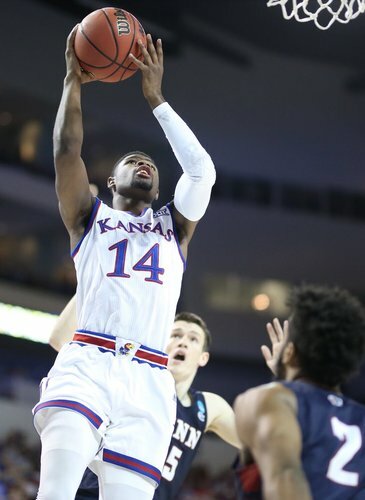 What Vick just did is exactly what #KUbball has to do every trip down... Have to finish, but that's their advantage. Big time. Penn has certainly cooled off but Jayhawks can't take advantage. Ryan Bentley swishes a 3. Timeout Bill Self. #KUbball with 11 points in 11+ minutes. 1-of-7 from 3-point range... Penn leads 19-11. 8:32 to play 1st half. Timeout Self. KU now 1 of 7 from 3-point range. 8:32 left in 1st half. Penn is 4 of 7. This years squad seems to read their pub. They have heard they are considered vulnerable today and even more so in a possible NCST matchup in the round of 32. Hope it fires them up. More time to grow more game for Mitch and Silvio for sure. If we weren't tight to start with we are now. Udoka Azubuike checks in for the first time. Hello emergency situation. First possession goes to Dok but he passes back out. He's got to use his size. Penn won that 50/50 ball uncontested. Quakers gaining confidence with each defensive possession. Graham with a must-have putback. KU down 8. Huge effort by Graham there... First to get the steal and then to get that tough, tough tip. #KUbball needed it and the crowd responded big time. Timeout Penn, leading #KUbball 21-13, 6:54 1st half. Big sequence by Graham with KU down 10. 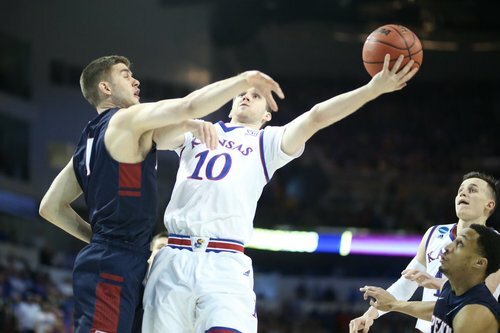 Swiped a steal, threw ahead to Svi, sprinted to follow missed layup and scored a putback. #KUbball down 21-13. 6:54, 1st.